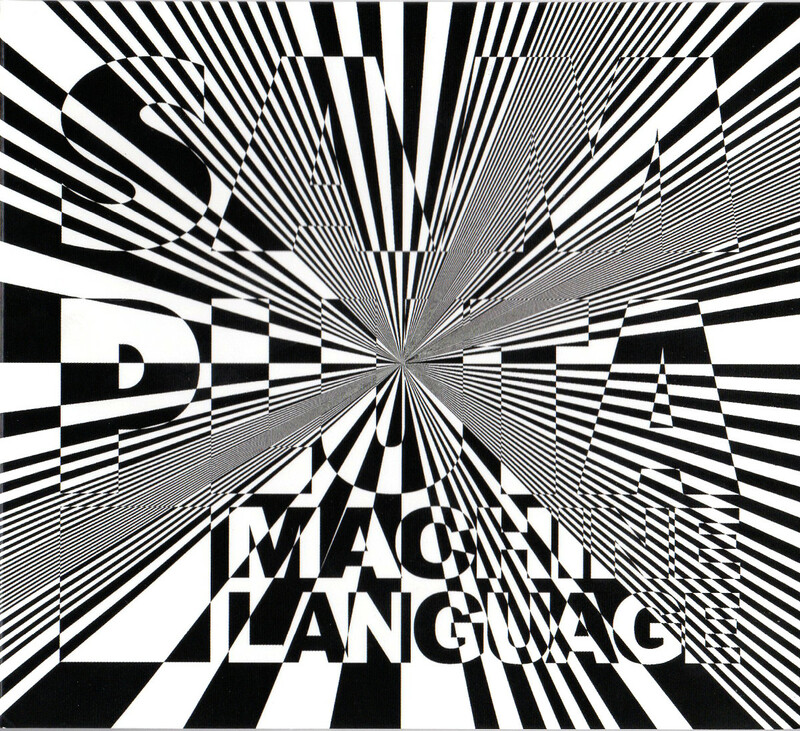 Machine Language (CARRIER RECORDS 016) is a showcase for the compositions of Sam Pluta, performed here by TimeTable Percussion, The Mivos Quartet, Jessie Marino, Ian Antonio and Pluta’s own Wet Ink Ensemble. These are all New York City groups and the album was released on New York’s Carrier Records, whose select catalogue of extreme avant music I recommend highly. It’s probably clichéd thinking that leads us to characterise New York music as somehow more “energetic” or “nervy” than usual (we could say it about everyone from James Chance and the Contortions to Eric Bogosian to Steve Reich), but there’s plenty of angular, brisk and muscular movement in much of this music. It certainly applies to the urbanised semi-organised chaos of the title track, experiencing which is like having your ears threaded into a large, mechanical loom, the atoms of your corporeal frame redistributed into a million and one cheap suits to be sold in the Garment District. It’s an exciting episode where rattling and booming percussion slugs it out with strange electronic moanings, accordion drones, or stabs of moody avant-jazz chords played by a stiff and formal woodwind section. After that comes ‘Lyra’, performed with amplified strings by the Mivos Quartet, a single-minded ultra-minimal block of seething abstraction which, for its first half, boldly takes the idea of microtonality into a sub-atomic range. Crank up this high-pitched glacier of frigid beauty to induce instant tension in your ligaments…rarely have the strings of violins sounded so eerie and threatening. ‘Matrices’ is a percussion / electronics / performance producing 10 minutes of energised delight…Google it and the first thing that comes up is the published score, clueing you in to the set-up and the sound sources, which include woodblocks, snare drum, hand-held fans, two TV sets and a very specific microphone array. The “special sauce” is Pluta’s computer software. The thrust of the piece is about making abrupt switches, perhaps through the mixing desk, between assorted sources, many of which are distorted or degraded in some way, to create a fascinating weave of textures so palpable you can feel them racing past under the soles of your feet. With its slightly more anonymous tone, this is the least “human” track on the album, but it’s far from being a bleak view of our mechanised society. ‘7:6’ is even more machine-like, performed entirely by Jessie Marino on her amplified cello whose natural tone has been expertly distorted to precisely the correct degree until it resembles the attack of a flock of crazed robot-seagulls. Marino’s bowing gestures shine forth; rather than being subjugated into a morass of random noise, they are instead magnified and given additional power and resonance through the set-up. ‘7:6’ is a magneto that simultaneously drives you out of the room and keeps your feet rooted firmly to the spot. Press release uses terms like “relentless” and “sonically saturated” to describe Pluta’s strong work, terms with which I can only concur, having been run over by the tracks of his Chieftain Tank while happily waving the white flag of surrender to his marshalled forces.